I hadn't found Fen's second album, Epoch, to be much of a keeper, feeling like it was riding along on the blackgaze bandwagon without really contributing much of its own. I'm very glad to find that on hearing this latest release of theirs I'm much more taken by their sound; perhaps they've improved and matured in terms of their overall atmospheric black metal mastery, or perhaps it's that the album shows a bit more original ambition this time. Constructed of one continuous multi-part suite, it takes the listener as promised on a journey through chilly landscapes - and whilst winter-themed black metal isn't something there's a shortage of, Fen's baroque, intricate take on it is a real treat. 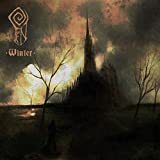 Post a review of FEN "Winter"